Nifty hourly chart has corrected from the high of 4801 and closed above 4700 yesteday, Today SGX suggests opening near 4700 range. 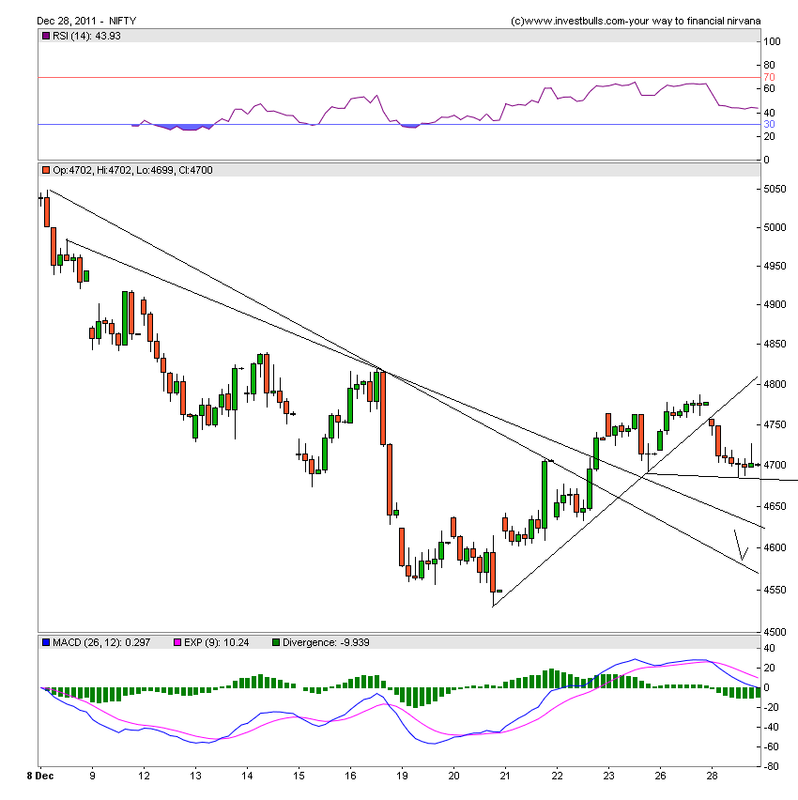 Break of 4682 on Nifty will lead to 4631 levels where next major support lies. 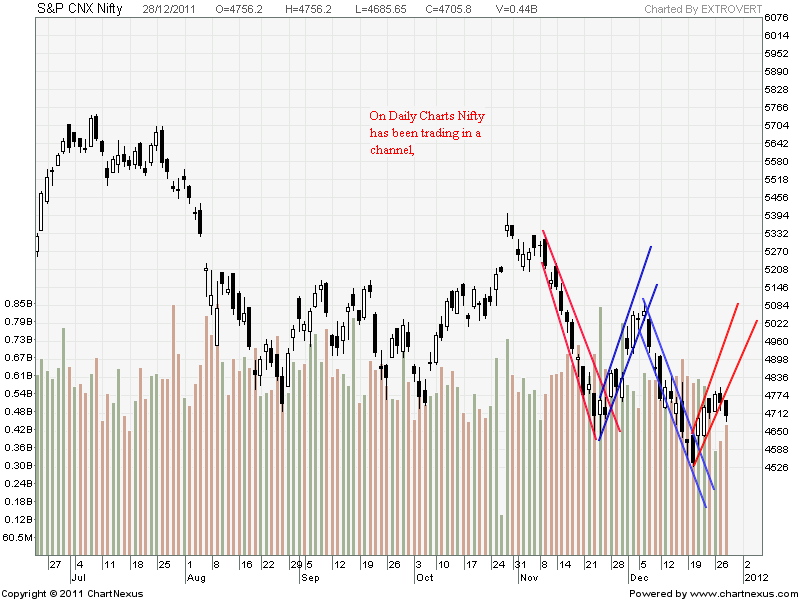 Daily chart nifty has broken the upper channel which gives bearish signal. 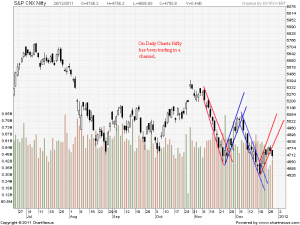 As i have advocated Nifty is trading in channel from past 3 month as marked in the chart shown above. Also formation of Higher High has stopped as Nifty was unable to cross 4801 yesterday. So things are intretingly poised before the last expiry of 2011. 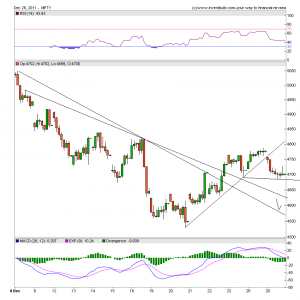 Break of 4682 wll ultimately break the rising channel and can be catastrophic as we can make a new 52 week low before the end of 2011 year.So trade with caution on longs. 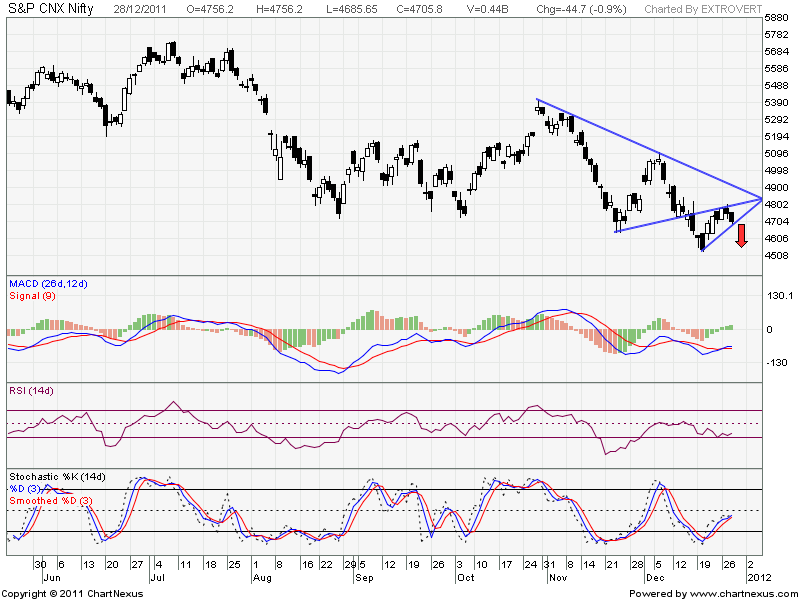 Close below 4631 Nifty is poised for a rough ride. November Expiry we closed at 4756. So we have closed below both levels Nov Expiry ie 4756 and 4815 means Bulls are in Pain . Today 4700 PE showed liquidation of 8 lakh contract means now 4700 will be taken down tomorrow. The interesting Observation Puts 4500-4800 do not have OI greater than 70 lakh that to on expiry day which is really strange. It means if 4631 breaks on downside market will fall over its own weight and we can close at the lower end of series ie below 4531. Feb Expiry we corrected 3.21% and same can be repeated today looking at OI less than 70 Lakhs in major strike prices from 4500-4800. On Upside 4800 CE is having the highest OI 77 Lakhs it becomes the resistance on Upside. Crossover of 4770 can make the case for expiry above 4800. 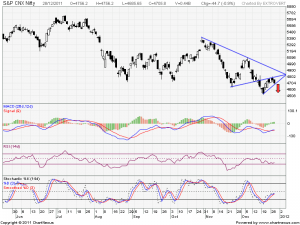 I have 3 prefered count on nifty, 1 bullish and 2 bearish. but all the 3 counts point to higher levels in comming days. Gr8 analysis and in depth explanation. well, we have little incorrect this time but it doesnot matter because in this market no one is 100%. so dont dissappoint sir. I am sure u will continue to guide us in this market.I extent my thankness to you.GOD BLESS YOU.